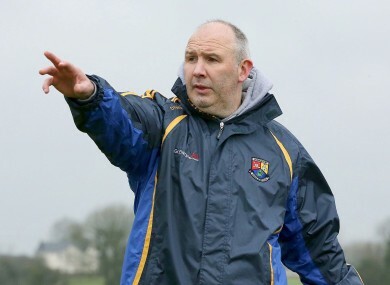 LONGFORD MANAGER GLENN Ryan believes the FRC’s new black card rule will increase confusion for referees. The Football Review Committee revealed their proposal last week that players shown a black card will have to be automatically substituted and not allowed to return to the game. Yet former Kildare star Ryan has concerns about the rule. “It introduces another layer of confusion to referees. It’s not great from a promotion viewpoint of our games. “My view is that if a fella takes a decision to do something cynical, even verbal abuse, that is pre-meditated. That should be severely sanctioned with the cards that are there. Ryan was speaking as part of a panel discussion at last Saturday’s annual GAA coaching conference in Croke Park. The chairman of the FRC Eugene McGee was also present and he defended the new proposal which is set to feature as a motion at Congress in March. “Currently it happens that yellow card offences are being rotated around a team. That type of systematic fouling annoys people. The black cards will help to stop that. Former Dublin manager Pat Gilroy praised the approach of the FRC in attempting to eradicate cynicism from the game. “All the diagnosis is spot on and all the problems have been clearly identified. Even in kids’ games they get away with it. The advantage is with the team that is most cynical. Pat McEnaney, chairman of the National Referees Committee, was also part of the panel and defended the accusations of inconsistency amongst referees. Would the sin-bin be a better system for Gaelic football than the black card proposal? Let us know in the comments section below. Email “Glenn Ryan insists black card rule will increase confusion”. Feedback on “Glenn Ryan insists black card rule will increase confusion”.